Nathaniel Baxter, born in Colchester, Essex, received his Master’s degree from Magdalen College, Oxford, in 1577. Following his time at Magdalen College, Baxter held several posts in the church, including warden of St. Mary’s College, Youghal, Ireland, where he probably knew Edmund Spenser. Baxter published a number of sermons, letters, and books on Puritanism, including A Sovereign Salve for a Sinful Soul (1577), The Lectures of J. Calvin upon Jonas (1578), and Answer of Nathaniel Baxter … to Mr. Jo. Downes (1633). 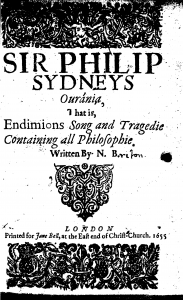 In 1606 Baxter published his most notable work, excerpted here, Sir Philip Sydneys Ourania, That is, Endimions Song and Tragedie Containing all Philosophie (1606). Baxter’s importance in the literary world relies upon his connection to the Sidney family: he tutored Sir Philip Sidney in Greek and remained connected to the family throughout his life. The Ourania is prefaced by poems dedicated to the women of the Sidney family; beyond this, Sidney appears as a character in the conclusion of the poem as Astrophil. In the poem, Baxter is presented as Endymion, a shepherd, who is approached by Cynthia (Sir Philip’s sister, Lady Pembroke) and her nymphs, who ask Endymion to sing. Within the text, in an apparent effort to evoke a sense of distance and the exotic, Baxter makes multiple references to Florida. These inclusions indicate that Florida had some place in the minds of the most prominent Elizabethan poets, with whom Baxter was acquainted. The selection below is from a 1655 printing, with minor orthographic changes, and was selected for its relevance to “terra Florida.” A table at the bottom glosses antiquated terms and classical references in this highly allusive poem. __________. “Baxter, Nathaniel.” Dictionary of National Biography, Vol. 3. Edited by Leslie Stephen. Smith, Elder (London, 1885). 433-34. Baxter, Nathaniel. Sir Philip Sydneys Ourania, That is, Endimions Song and Tragedie Containing all Philosophie (1606). Now must we speake of earths blessed mother. Resplendent Phoebe, chaste, powerfull and true. She doth allay, and coole with moistning streames. In whom her princely vertues seated be. Her name thy mightinesse shall dignifie. Betweene thy selfe and her Magnificence. Of all the earth as shepheards finde by Art. Great Phoebus in her course to overtake. She over takes the Sunne, Ptolomie saies. Once every month, meet in conjunction. O joyfull time when these two Lovers meet! When with sweet Congies one doth th’ other greet. Phoebus must part swift time calles him away. No houre granted in idlenesse to maske. Drenching their spawne in the brinish flood. Mought safely touch their port with pleasure. Where never walked mortall living man. Where with the Robes of Nimphes been garnished. At each full see for comforting their Spawne. To ebbe and flow to voyde corruption. And perfect Meanes of Vegitation. Or skill of mortall man can know. Requireth a speciall discourse alone. Till they have got strength and maturitie. But is maintained by her mighty power. To ease the sicke, and stop it fast againe. Marking the signe wherein fair Phoebe lyes. By glorious Pan as you have heard disclosed.